Set to stand out amongst Arriva Southern Counties’ buses in the Medway area are six 14-plate Euro5 ADL Enviro400s being placed on its 101 route in Medway. The service has been upgraded to the operator’s premium Sapphire brand and branded accordingly. 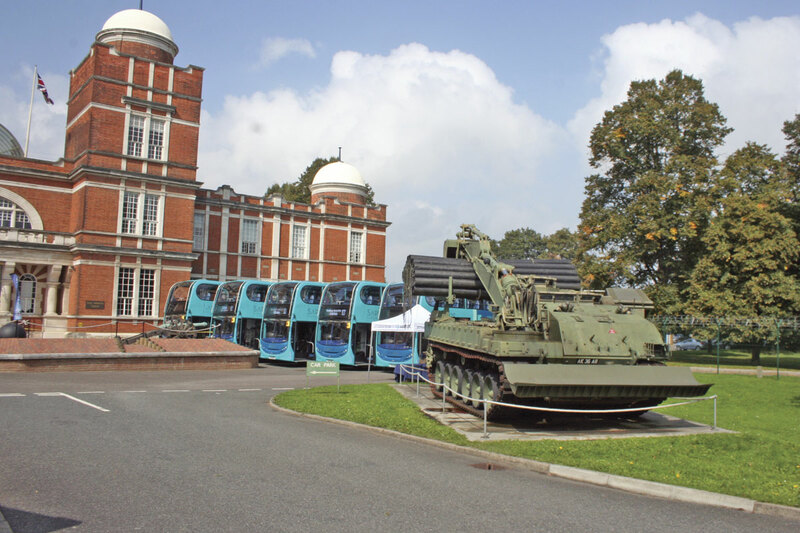 The £1.2m worth of new vehicles were introduced to press and the public at a launch event at the Royal Engineers’ Museum in Gillingham, displayed amongst the historic tanks and armoured vehicles at the site. Chris Peat attended the unveiling of the buses. 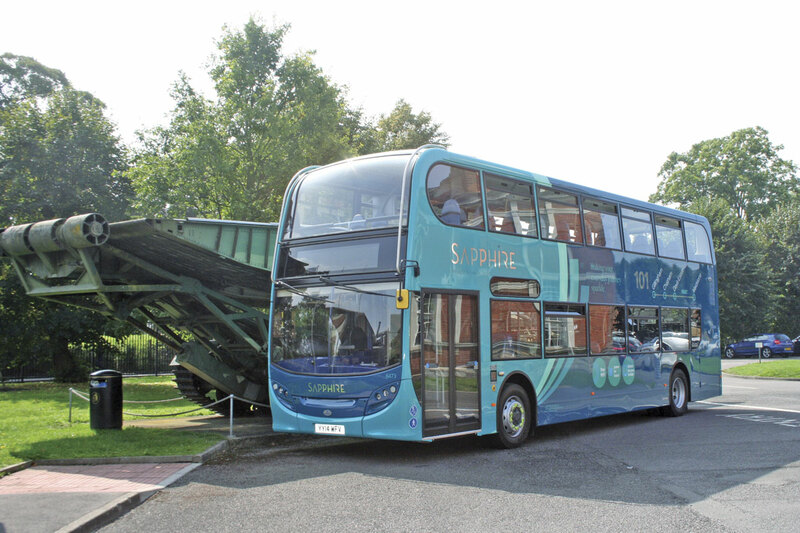 Though launched on the previous Wednesday, Arriva’s latest batch of high specification Sapphire buses were scheduled to go into service on the 101 route between Gillingham, Chatham and Maidstone on 7 September. The specification will be familiar to anyone who knows the Sapphire brand. They feature three-pin and USB power points to charge phones and lap-tops, free wi-fi, audio-visual next stop announcements and E-leather seating. As is the case with its Sapphire services across the country, customers can benefit from a money back guarantee if they believe their customer care was not up to standard. Sapphire is not just about branded buses though, the service has its own dedicated drivers who have undergone extra customer care training prior to driving the new vehicles. The team combines some of the most experienced in the company and few can say they are more experienced than Ken Thomas. Ken has been a bus driver for 50 years and described the new Sapphires as really nice buses, with good technology onboard and power steering, ‘not like the old days!’ He thinks the passengers will ‘love them’. The six new vehicles on the 101 replace six year old Enviro400s. As well as being the first Arriva Southern Counties Sapphire buses, what else helps them stand out is the fact they are brand new. Initially, three of the four Sapphire services had buses that had been refurbished, with only one receiving brand new vehicles for the upgrade to the premium offering. Speaking to Kevin Hawkins, Arriva Southern Counties Regional Commercial Director, I was told that the use of new buses on these services is planned to be the norm for future roll outs of Sapphire. 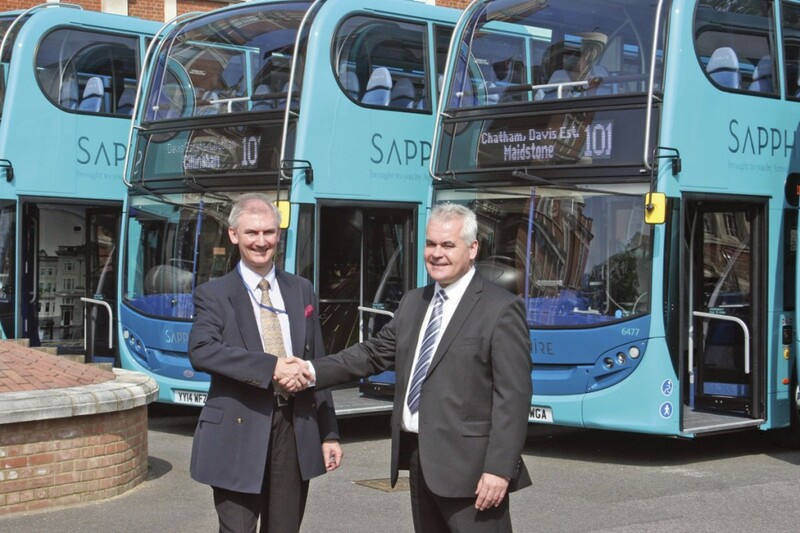 In addition to the six new buses, Arriva has also transferred two existing Sapphire-spec Enviro400s from its Aylesbury depot, which had been in use as spares for the 280 Sapphire service between Aylesbury and Oxford, but painted in standard Arriva external livery. These have now received full Sapphire livery but without branding for the 101 service. Four of the existing buses on the 101, six year old Enviro400s, are being refurbished by ADL at Harlow. Two of these are away at the moment and at the time of writing were due back imminently, after which the other two will be sent for refurbishment. Once Arriva has the full complement of Sapphire specification vehicles it will have a total of 12 equipped for the 101, with an eventual PVR of ten, plus two spares. The arrival of the last two refurbished Enviro400s will allow an increase of the main daytime frequency from every 15 to every 12 minutes. The 101 currently runs every 15 minutes (and has done for several years), however the evening service has been increased from hourly over some sections. The service has been supplemented with extra journeys that now give a half hourly frequency between Maidstone and Chatham, extended hourly to Gillingham. The Monday to Saturday evening service between the two towns has also been increased to run half-hourly. Kevin said the 101 route was chosen for the Sapphire upgrade due to its success. The idea behind the premium branding schemes across the country is to ‘take the successful routes and take them further, steadily increasing the number of them we run over the years’. When asked how he expects the improvements to the 101 will affect patronage, Kevin was upbeat. He said previous Sapphire rebrands had been successful in a short space of time, making him confident this latest one will also do well. Interviews with passengers using the new premium services had revealed ‘quite a few’ had switched from car to bus since their introduction. 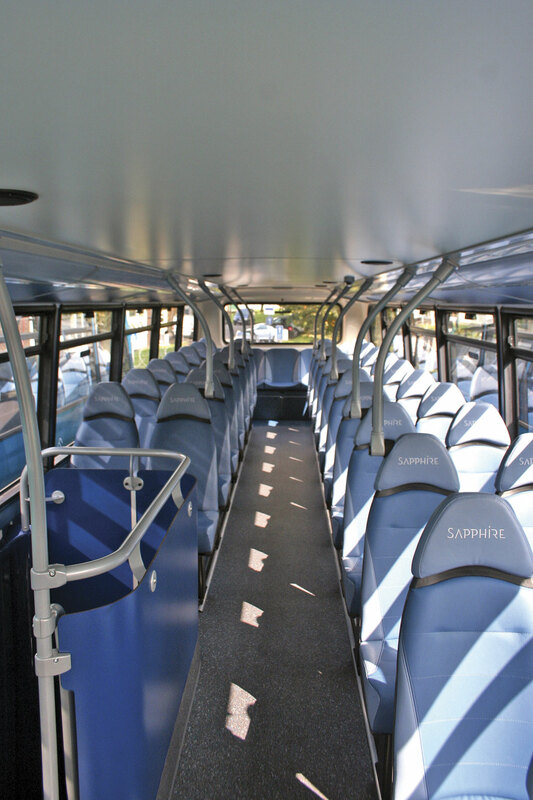 A particular success story was the Aylesbury to Oxford Sapphire route, which had experienced a 10% growth over its first 12 months under the new brand and appears to still be growing. Of course, it is not a case of launching the buses and just expecting more passengers to get on board. Arriva Southern Counties is promoting the enhanced 101 by running a door to door leaflet drop campaign, posting the leaflets to communities throughout the route. The company’s website is also being modified to feature a dedicated Sapphire page. As part of its marketing plan, there was a special display of the six Sapphire buses at the Royal Engineers’ Museum for the public following the press event. To draw in the crowds, Royal lookalikes of Kate and Harry were on hand. Launching Sapphire has not been Arriva Southern Counties’ only development in recent months. The company has introduced 12 Wrightbus Micro-Hybrid StreetLites in Gillingham. Four more have been placed in service in Maidstone on route 89. Kevin said the StreetLite with the hybrid option is proving attractive. In Southend, the operator has also increased the frequency of its route 1. Commenting on operating in the Medway area, Kevin said it is ‘quite challenging’. One of the main problems is traffic congestion, especially at peak periods. Another is it is ‘built on hills’. The network is high frequency and ‘pretty sound’, he said, adding that the company has tried not to ‘chop and change’ too much, it is already ‘quite stable’. Medway is a good area for bus use, according to Kevin. However, ‘there is still more work to be done, hence why we’re rolling out this latest Sapphire project’. 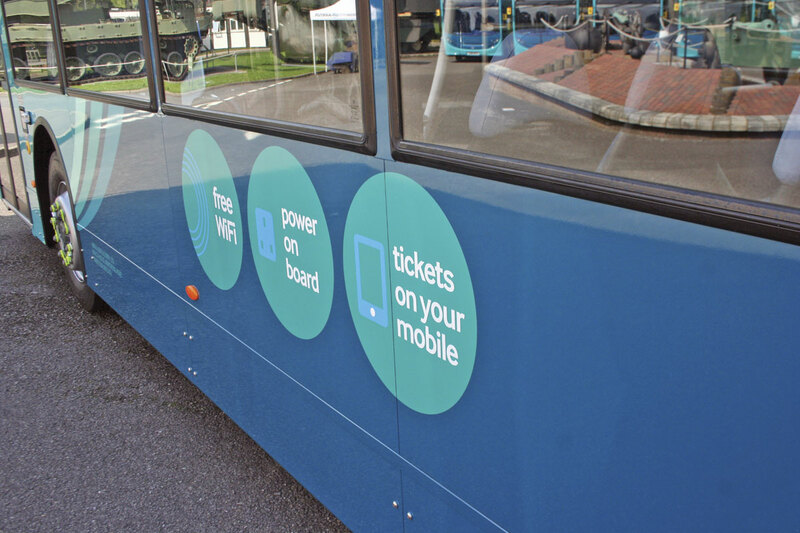 Arriva is working with Medway Council to increase the use of smartcards in the area, which would be geared towards getting car users on the bus. The car is the company’s biggest competitor, according to Kevin. He said the region’s local authority have been supportive of increasing bus use in the area, having introduced bus priority measures and a new town centre bus station. Arriva is currently working with them on service frequency experiments, with the council providing the funding for them, the 101 evening frequency increase being an example of that. Speaking during the launch, Arriva’s Regional MD, Heath Williams, said, ‘I remember the 101 in the 80s and it has come on leaps and bounds since then.’ He went on to say the service is only what it is now because it has been nurtured by the team from Arriva’s Gillingham depot.